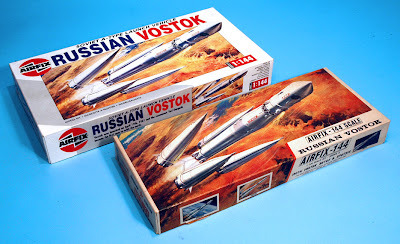 Further to last week’s report on the Airfix 1:144 scale Vostok kit reissue (see it here) celebrating Yuri Gagarin's famous 1961 flight, as I provided the change of details needed to Airfix, here’s more of an explanation. 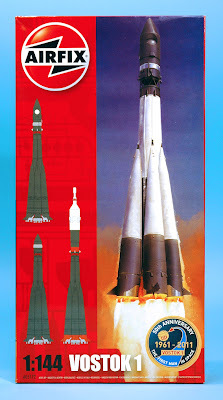 The kit itself was released way back in 1969, when we in the West had only recently found out what this Soviet rocket actually looked like. Although flown as early as 1957 to launch Sputnik 1, it wasn’t until 1965, four years after the Gagarin flight, that the shape was revealed. The first two Vostok boxes. 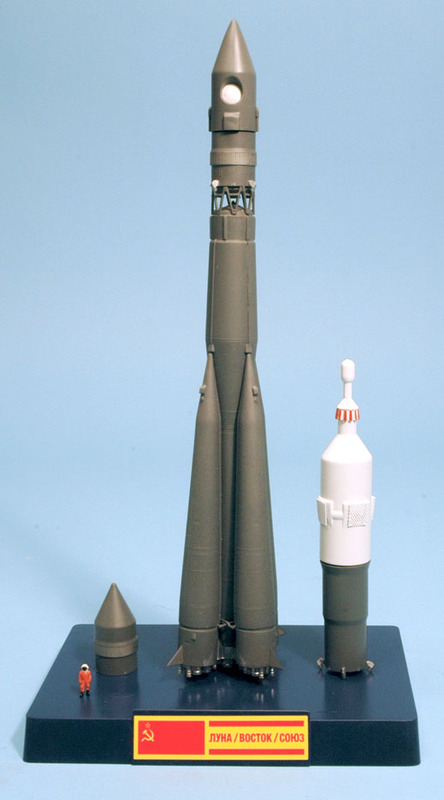 Bottom is the 1969 original, above is the 1991 version, with my suggested additional wording: ‘Soviet A-Type Launch Vehicle’. Because details were still sketchy even in 1969, the kit was not entirely accurate. To be fair, most of it did come out pretty close, but the main problem was with the four tapered boosters. These were too thin, and made the rocket look sleeker than it actually was. In reality, these boosters are somewhat fatter, making the rocket look more dumpy. Unfortunately it wasn’t possible to correct them in this reissue, but everything else has been sorted, including the colour recommendations. New box for the Airfix Vostok launcher. Three configurations are included, but the emphasis is on Yuri Gagarin, as 2011 is the 50th anniversary of his flight, and the box features a commemorative sticker. New Airfix space kits have box art by Mike Trim, who also did designs for early Gerry Anderson TV series. When the full-size mock-up was first seen, it was painted white, and as most US space launchers were white, it was assumed quite naturally that this was correct, and this was the Airfix recommendation too. However, once photos of the real thing appeared - though most were atrocious quality, and if they were in colour, even more atrocious colour - it was apparent the rocket wasn’t white. Instead, it was a dark camouflage colour, almost certainly green. This made sense, as the rocket was adapted from a missile, which tend to be camouflaged. So the paint instruction then became ‘camouflage green’, and this has been in place for a decade or so now. Trying to sort out which grey to suggest, using Humbrol’s colour chip book. However, given the task by Airfix to update the introduction and colour schemes for this reissue, I looked into the matter further. One rumour was that the ‘green’ is actually grey. However, most images still looked green, a result it seems of colour bias. Most film stock - we are talking traditional film here - has a bias to one section of the spectrum. Ektachrome tended to be biased toward blue, while Kodachrome went the other way, toward orange. Soviet-era film went towards green, and it appears, extremely so. If the rocket WAS grey, this, on the face of it, the most boring of colours, is actually in many ways the most enigmatic and due to a phenomenon known as metamerism, ‘real colour’ can take on various hues depending on many factors, particularly lighting. So you ended up with the grey of the Vostok launchers being referred to as ‘green’ because that’s how they looked in most photographs. It wasn’t until Western observers started to travel to what is now Russia, and were able to see the rockets directly ‘up close’, it was discovered they were painted grey, not green! Vostok launcher with the other options, Luna and Soyuz. You get two nameplates - one in Cyrillic lettering (as here) and one in Roman script. The completed launcher is in the accepted ‘grey’ - though, depending on your monitor settings, it may still look green! That solved one major problem for me, but introduced another - OK it was grey, but what grey? 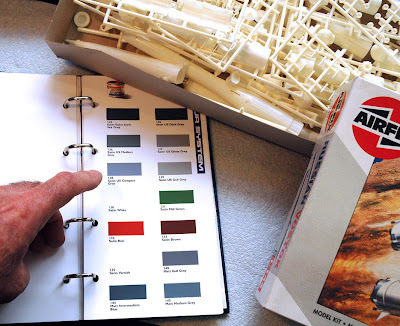 As the kit was Airfix, and the paint section of Airfix’s owner, Hornby, is Humbrol, the paint recommendation had to be, fairly logically, a Humbrol colour. The slight problem was that Humbrol makes 27 shades of grey, (28 if you include primer), so which shade should I recommend? After a lot of head-scratching, I first ended up with a shortlist of ten, then whittled it down to either 126 US Medium Grey or 156 Dark Camouflage Grey. I was tending towards the former, but then realised that it was close to 27 Matt Sea Grey, which had a clear advantage - it was available not only in Humbrol’s classic tinlet, but also in a spray can. So to make everything easy, the choice for the Vostok, and any similar Russian/Soviet launcher, is Humbrol 27 Matt Sea Grey. So the rocket is grey - but it can also be white… More on that next time! 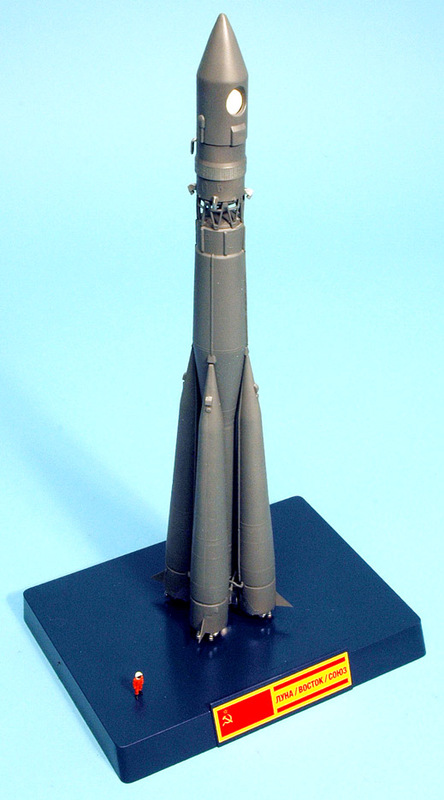 See more in my article on building the Airfix Vostok launcher in Airfix Model World, Issue 5. AMW is here.